The Shadowscapes Tarot is a deck set in a fantastical world of whose 78 images could single-handedly define the word exquisite. It was created by artist Stephanie Pui-Mun Law, published by Llewellyn. The set is packaged with a 253-page book titled Shadowscapes Companion, co-authored by Stephanie Pui-Mun Law and Barbara Moore. The cards measure 2 3/4" x 4 5/8", and feature reversible backs. The cards come shrink wrapped in a large outer box, which also houses the companion book. There is no tuck box for the deck, so you are left to find another way to store your cards. The borders are a light lavender/grey color with a slight yet interesting metallic tint to it. As far as borders go, they are thankfully unobtrusive and blend in well. However, this deck could have benefited tremendously by being borderless, thereby stretching the canvas even the slightest bit in every direction, for reasons I will touch on momentarily. The artwork was done in watercolors, which adds a softness and touchability to the scenes which seem otherwise too beautiful to be real. The Shadowscapes Tarot is a stunning deck full of undeniably beautiful artwork. Among other tarot decks, it's like a supermodel in a room full of ordinary looking people. The type of beauty that is impossible to ignore, making the other decks in the room feel ugly and inadequate in comparison. Not that they are. The Shadowscapes just has a way about her that makes one stop and stare. Looking through the cards, you feel swept away - captivated and enchanted by this magical world of beauty where people, faeries and animals cohabitate in harmony. That's the good news. The bad news is that many of the details are so minute that they are difficult to see. The canvas size of the tarot card is, in my opinion, regrettably too small for such an intricate deck. I find myself squinting all too often, or pulling the cards within inches of my face to try to make out the details, often unsuccessfully. I'm not a fan of large decks, but this is definitely one that should have been printed on larger cards, or even borderless, to give it any extra room possible. It seems a shame that so much of the painstaking detail is lost due to the limitations of card size. One of my favorite cards in this deck is The Hermit (shown above). I love how the Hermit appears simultaneously ragged and elegant. And I'm bizarrely thrilled with how the artist put a hole in one of the rocks upon which he stands, which makes me think of a seeing stone (through which one can see faeries). It's probably my favorite Hermit of all time. Another favorite is the tea party scene of the Six of Cups (below). The innocence and purity of the scene just melts my heart when I see this card. It simply makes me happy. It'd make the perfect wall hanging for a little girl's room. The Two of Cups is also one of my favorites (at left). I'm beyond smitten with how the trees are entwined together in love. This brings me to another aspect of the deck that I adore. The trees. I'm fascinated by trees, so I am really impressed with the things Stephanie has done with the trees in her deck. The Hierophant, instead of the typical religious figure, is a dryad. This actually makes me gravitate toward the Hierophant, which is a grand feat, as I am usually repelled by him. I am much more likely to listen to what a tree spirit has to say than a priest. The Death card emphasizes the transformational aspect to the card by illustrating a Phoenix, highlighting the aspect of rebirth, rather than the finality of a grim reaper and scythe. The Eight of Pentacles also takes a less traditional path, featuring a spider weaving pentacles in its web. This is another of those cards that makes me think twice (like the King of Pentacles), because most of the spiderwebs I've seen in tarot are matched with the Eight of Swords. Something being stuck in a web. So it's automatically another "Eight" that I automatically think of when I first see this card, though the spider's diligence and craftsmanship is also very appropriate for the Eight of Pentacles. One of the cards that doesn't do it for me is the Wheel of Fortune. It is a beautiful card, to be sure. But I just don't get "wheel" from it. I don't see movement. I see a lovely circular stained glass window. But not a wheel. And I sorta need my Wheel to be able to roll. That movement is the whole point of the card. So this card doesn't work for me, pretty as it is to look at. The cards have a lovely flow to them, and speak clearly to the inquiries I have made of it thus far. I have mixed feelings about the practicality of how it reads. Sometimes I feel frustrated that the details are too hard to see clearly, especially facial details, yet at other times this lack of clarity leads to a reading where the focus is more on the overall flow from card to card. Instead of zooming in on the details, I get more of a "feeling" from each card, almost as if I were looking at it without glasses and allowing the colors and movement and flow to guide the reading more than anything else. Sometimes this works wonderfully, and sometimes it's irritating. It depends on the type of mood I'm in, and what I want out of a reading. Shadowscapes Companion is a delightful accompanying book. Barbara Moore provides the introduction and several spreads at the end, while Stephanie Pui-Mun Law provides the meanings for the cards. 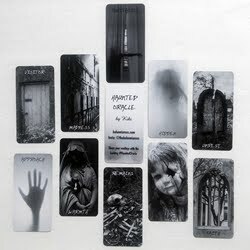 There are full page black and white images of each of the cards, as well as commentary by the artist. 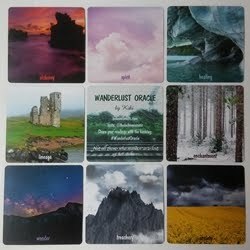 She tells a lovely story about what is going on in each card, then weaves the card meaning into it. Several of these spreads called for me to try them out immediately, which was a delight. It's refreshing to come across uniqe, original spreads in a companion book. 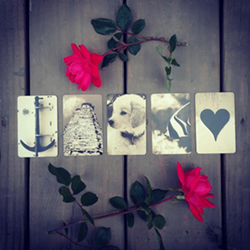 The artist has done a wonderful job at portraying the meaning of each card. The deck strays far enough from RWS so as not to be a clone, but stays close enough to the understood meanings to be recognizable at first glance. Trying to summarize my view on this deck has me feeling a bit like the fellow in the Two of Pentacles, attempting to juggle two different viewpoints. On the one hand, this is the most gorgeous deck I own. On the other hand, the detailing is difficult to see with ease. And I never fail to notice both of these things every time I look at the deck. Because of the issue with the small detailing in the cards, it's not one that I will be able to use as a main reading deck, which is a shame since it's so gorgeous. 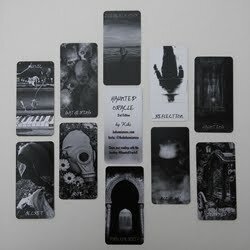 But it's definitely a deck that I am quite glad to have in my collection and will continue to use for inquiries that are conducive to more ethereal, spiritual readings where I can simply allow the essence of the cards to emanate. Visit Stephanie Pui-Mun Law's website: Shadowscapes.com. Deck: Shadowscapes Tarot (by Stephanie Pui-Mun Law, published by Llewellyn). 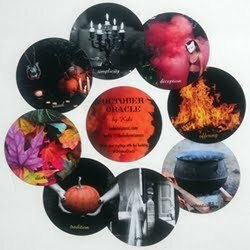 This deck review was originally published on my previous blog (Tarot Dame) on 6/7/10.